Last month, Seinfeld stars Jerry Seinfeld and Jason Alexander were spotted outside Tom's Restaurant in Manhattan, the location that inspired their characters' regular hangout Monk's Diner in the series. While it was never confirmed what the reunion was for, it was revealed during the Super Bowl XLVIII halftime show that the reunion was for an episode of Comedians in Cars Getting Coffee. 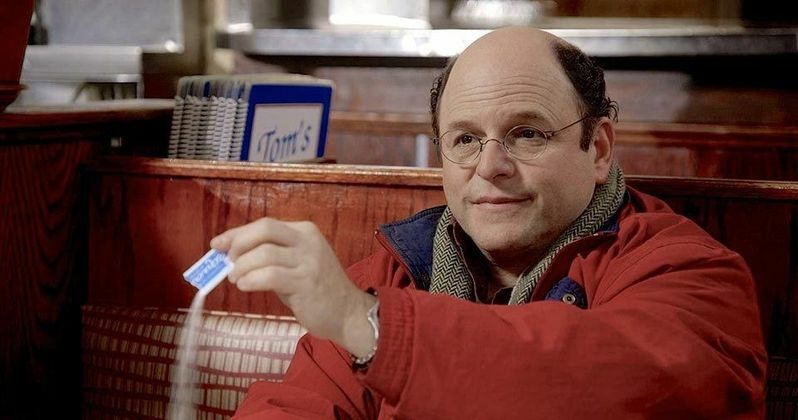 The full version of that episode has now debuted on Crackle, featuring Jerry Seinfeld picking up Jason Alexander in a 1976 Pacer, with both of them portraying their iconic characters for the first time in 16 years. Take a look at the episode, which also features a special appearance by Wayne Knight as Newman. Take a look at the full episode, then read the official press release for more details. For the first time in 16 years, members of the cast of Seinfeld reunite in character at their old stomping grounds in New York City for an original special edition of hit series, Comedians in Cars Getting Coffee. The shorter version was seen earlier this evening at the Super Bowl XLVIII halftime show. In a brand new episode of Comedians in Cars Getting Coffee, Jerry Seinfeld picks up his "best friend for almost every single day of the 1990s," George Costanza in a 1976 American Motors Pacer-a car Jerry describes as perfect for Costanza since it "doesn't work, looks ridiculous and falls apart." The duo ride together to the legendary Tom's Restaurant (aka Monk's Cafe) for a cup of coffee and some famous Seinfeld banter, when they're interrupted by a crazed Newman. Crackle announced a fourth season of hit original series Comedians in Cars Getting Coffee starring Jerry Seinfeld earlier this year. The popular web series will continue with six new episodes exclusively on Crackle, all Crackle platforms and ComediansInCarsGettingCoffee.com. Season 3 of Comedians in Cars Getting Coffee showcased an all-star line-up with Louis C.K., Tina Fey, Jay Leno, Patton Oswaltt, Todd Barry and the season finale airing this Thursday, February 6th with Howard Stern. With 25 million streams, Comedians in Cars Getting Coffee takes the title for the number one original series on Crackle. Since the premiere of season one, the series has grown tenfold and continues to grow quarter over quarter.